Handcrafted concave spinning ring made from fine quality beaten sterling silver with three moving bands featuring Rainbow Moonstone, Iolite and a single silver heart. Because we all have fingers of different sizes we do not sell rings via e-commerce. 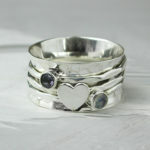 If you like any rings on this site and wish to purchase one, please call or email us. We can help you select the correct size for your or your friend’s finger.